This trellis was filled with cucumbers last year. 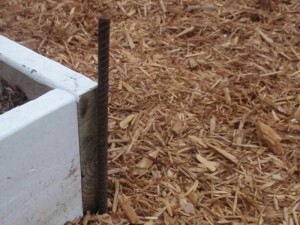 Utilizing vertical space increases the productivity of a garden bed. 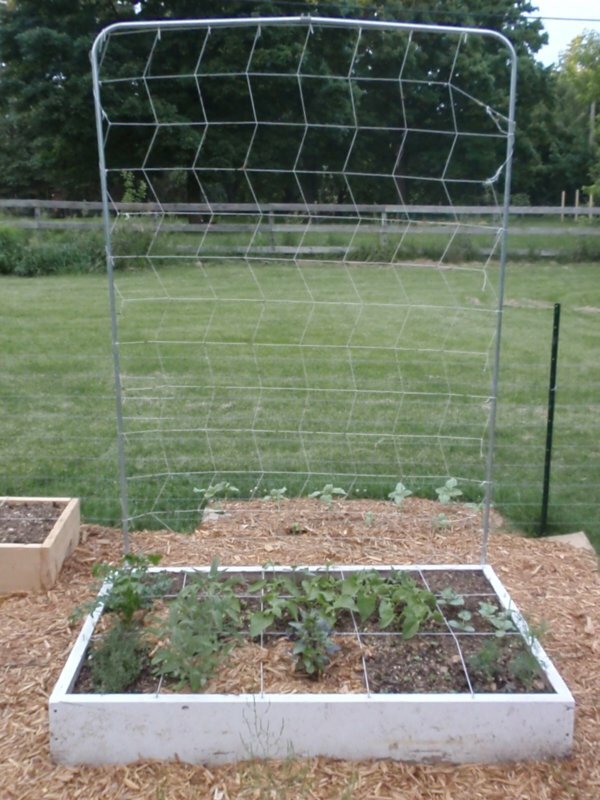 Mel Bartholomew’s All New Square Foot Gardening book has instructions for building a functional trellis like the one pictured here. Rebar is used to support the trellis. The materials are half inch electrical conduit and nylon trellis netting. I’ve taken to buying conduit ten sticks at a time because it has plenty of uses (such as building a chicken tractor.) The trellis netting is tied to the frame of the trellis. Two foot sections of rebar are pounded into the ground at the corners of a garden bed to support the conduit. Although I have had problems growing too many indeterminate tomatoes on this type of trellis, I have had great success growing cucumbers, snap peas and even watermelons on it. After growing perfect cucumbers on a trellis, you’ll never want to go back to growing them on the ground again. When grown on a trellis, the cucumbers do not turn yellow on one side. How many bush beans per square foot? Why mulch paths between garden beds? What do you like to grow on a trellis? I’d like to hear about it in the comments below.